The Pop Health Forum, a conference put on by the Healthcare Information and Management Systems Society (HIMSS) in Chicago this week, was as much about patient engagement as it was about population health. This makes sense, because it’s difficult to manage populations without reaching out — engaging — members of those populations. Jeffrey Springer, a vice president at Princeton, New Jersey-based health IT vendor and consulting firm CitiusTech, said that getting to population health means checking all nine squares on a 3-by-3 matrix. The X axis covers acute, ambulatory and whole-patient care, while the Y axis is about execution on clinical, financial and operational metrics. Patient engagement falls under all three care rows and at least two of the execution columns. Yes, financial performance has elements of patient engagement. “We’re really trying to drive a consistent patient experience across all of our platforms [of care],” Albert said. In fact, patient experience is part of what Albert called the “value-based core” of the academic health system’s goals for 2017. In her view, value equals quality — including the patient experience, proper resource utilization and clinical outcomes — divided by cost. 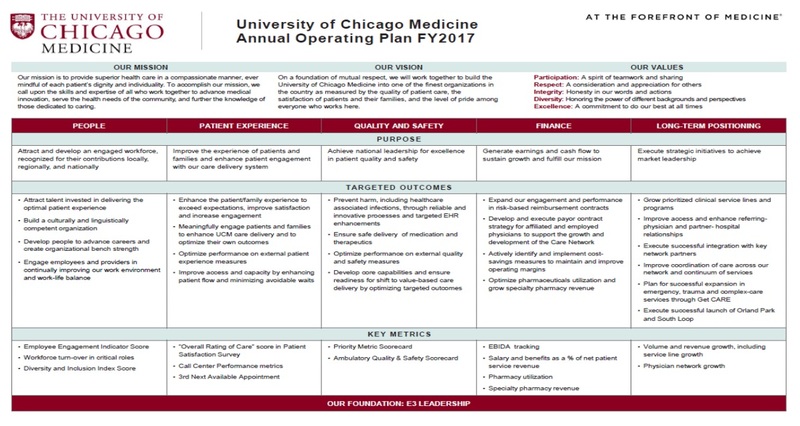 University of Chicago Medicine hasn’t reached true value-based care delivery yet. However, the goal is so important to the organization that the chief medical officer is in charge of implementing the core of enhancing collaboration, promoting telemedicine and selling faculty members on the concept of value-based healthcare, Albert explained. Indeed, clinicians are empowered as much as the health system aspires to empower patients. About three years ago, U. of C. instituted what Chief Experience and Innovation Officer Sue Murphy called “leader rounding.” At the time, rounding on inpatient wards and in the emergency department was paper-based. “We had no way of knowing what was going on,” Murphy said. The organization standardized inpatient and ED nurse rounding on iPads, consulting unit leaders and rank-and-file staff on redesigning rounding processes. U. of C. created a system of alerts and accountability, analyzing rounding trends and rewarding nurses for good work. Initially, Murphy and other executives didn’t realize that every nurse leader had a different comfort level with the iPads and with technology in general. Patients also had varying reactions to the presence of a tablet with each nurse who stopped in the room. “We came up with some keywords to say to patients,” Murphy said, to help reassure those who saw the iPad as an intrusion on the patient-clinician relationship. Individual nursing leaders also have been given autonomy to make process improvements within their departments and wards. “We strongly believe that the leader of a unit is kind of the mayor of that unit,” Murphy said. According to Press Ganey surveys of University of Chicago Medicine, 81.9 percent of inpatients in August 2015 reported that a nurse manager checked in on them daily. That number rose to 93.8 percent in July 2016. Overall hospital ratings, as reported to the Centers for Medicare and Medicaid Services, jumped from about 60 percent in 2011 to nearly 75 percent in the reporting period that ended in the second quarter of 2016. There was a sharp increase in 2013, the year the health system started rethinking nurse rounding. How many drinks do you consume per week? How frequently do you exercise? How’s your diet? For most people, this line of health behavior questioning can be the most uncomfortable part of a visit to the doctor’s office, possibly with the exception of those parts involving rubber gloves. If you’re like most people, you get a bit nervous, do some fuzzy math, and maybe flat out lie. People lie to their doctors, often. In medical school, we learned that it’s usually safe to double that number of drinks per week the patient reports. The same thing goes for cigarettes and illicit drugs. A glass of wine with dinner? Try a bottle. Only on the weekends? It’s probably a daily habit. With all this misinformation, what’s a doctor to do? Some relief may come from a new generation of wearables and smart devices, which are helping us better understand people’s actual health behaviors and what we can do to improve them. The misinformation may not be due to deliberate duplicity. It turns out that people are terrible at estimating what they’ve done. The American Journal of Epidemiology published data that showed, on average, people unintentionally under-report their total caloric consumption by nearly one third. This is problematic for a number of reasons. Inaccurate reporting can impact the doctor’s ability to make the right diagnosis or provide necessary counseling. 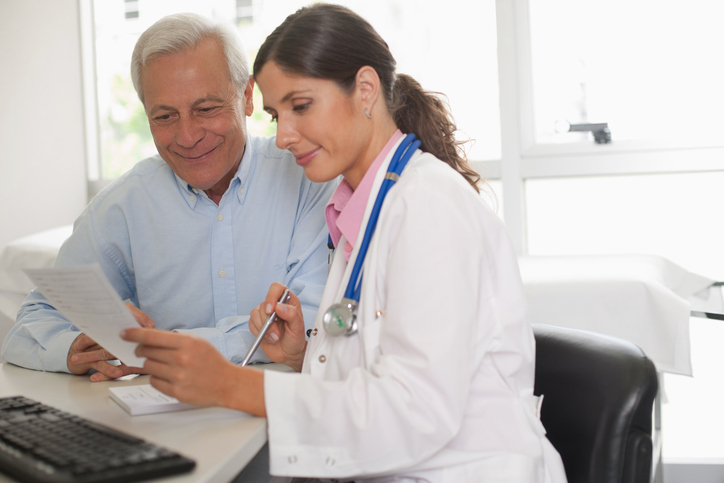 It can have a negative impact on the patient-physician relationship. It can even be dangerous for the patient. I had several experiences in residency where patients went into withdrawal a day or two into their hospital stay because they lied about their alcohol consumption or drug use. Relying on people’s recall alone to gather accurate information about their health habits is clearly a flawed method. What if, instead, there was a source of truth for this information? Some way for behavioral data to be easily collected, stored, and shared with your doctor, with less awkwardness and fewer lies. Could wearables and smart devices be this source of truth? One of the biggest challenges when trying to change behavior — whether it’s your own, a friend’s, or a patient’s — is maintaining motivation over time. You may tell yourself that you are going to get more exercise or eat less sugar, but if nobody is there to sloth-shame you into going to the gym or slap that cookie out of your hand, chances are you will revert back to baseline. The motivation to stick with lifestyle changes wanes quickly, which is why fitness resolutions for the New Year rarely last past February. Enter accountability. If you’ve publicly avowed to give up dessert, you’re going to hear about it when you dive into that cake at a family dinner. If you’ve found a gym buddy, you’re going to think twice before hitting snooze and skipping your morning workout. There is a tremendous amount of research around the impact accountability has on successful health outcomes. This is one of the reasons why Weight Watchers makes accountability a core pillar of their program, and why studies have found that programs like these are the most likely to lead to lead to long-term success. As a result, a number of startups have emerged that use accountability and wearables to promote health behavior change. Omada Health helps people at risk for chronic disease with an online digital health program that includes a health coach, online group support, and smart technology to collect data. The app Pact keeps people accountable to their health goals with financial incentives — if you don’t meet a health goal, such as logging exercise three times per week, you must pay other Pact members; if you meet the goal, others pay you. There are even tools that focus on self-accountability, like Pavlok, a wearable device that delivers a mild zap to train your brain to dislike bad habits and prefer good ones. While these forms of social accountability are great, they don’t address one big issue — that people tend to underestimate their overall consumption and are generally bad at reporting their behaviors. That salad you ate as part of a healthy eating kick may have way more calories than you thought (like the McDonald’s kale salad that has more calories, fat, and sodium than a Double Big Mac). And that crazy intense workout you just crushed probably burned far fewer calories than you think it did (one study found that participants were “inept” at judging the intensity of their workouts). Unfortunately, good intentions only get you so far. Making meaningful lifestyle changes not only hinges on social accountability, but also on a clear-eyed understanding of your own behaviors. This is another place where wearables and smart devices can come into play. By collecting data for you, these devices can help create an accurate picture of your lifestyle, highlight problem areas, and provide the data you need to make impactful changes. Fitness trackers are a great first step, and we are now seeing a new generation of smart devices emerge to serve as sources of truth for other health behaviors. Smart cups, forks, and plates can automatically track and log what and how much you consume, arming people (and their doctors) with the data that they need to stay accountable, change behaviors, and get healthy. Of course wearables and smart devices are not yet the perfect accountability partners. It is still possible to lie, even to them. You can strap your activity tracker on your dog, log a salad while you’re waiting for your cheeseburger, or “forget” to use your smart cup for that margarita. But it doesn’t mean they don’t have value. After all, you can lie to your partner, friend, or Weight Watchers group, but most people who are seeking greater accountability probably realize that is counterproductive. Even if they don’t, wearables at least make lying a bit more difficult. You likely won’t spend hours falsifying your Fitbit data before your annual physical, so that data may result in some advice from your doctor around how much exercise you need to reduce your risk for a whole host of preventable chronic diseases. At some point, lying takes more energy than simply letting the truth be known and embracing the consequences, which just might result in getting healthier.